We know the importance of safe and reliable electrical control systems. Through teamwork and our commitment to quality, we continually strive to ensure complete customer satisfaction. 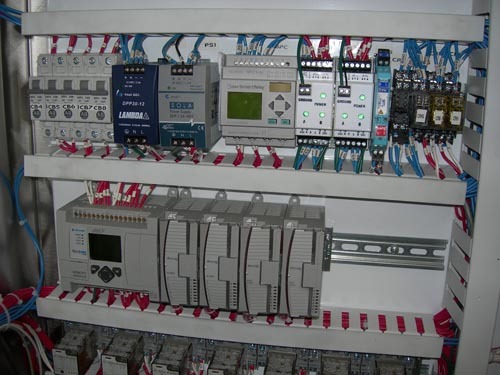 If you need a control system totally designed or just assembled, we can help. Our 10,000 sq. ft. facility is geared for just about any control project. If you need quick delivery on custom controls, Pantrol will meet your schedule. Whether your requirements are LARGE or small, we will be more than happy to provide you with a quotation. Contact us for a speedy response. Pantrol has extensive experience in the foundries and any industry that requires controls for handling the conveyance of materials from one location to another. We control vibrating, belt and bucket conveyors and integrate the associated controls such as weighing, zero-speed, speed control, interlocking and safety items. Every year hundreds of pneumatic conveying system control panels alone are designed and built at Pantrol. These controls are stationary and mobile. One area that we specialize in is vacuum controls for trucks for municipalities and industries that require quick cleanup or conveyance of material. Many of our control panels are used in the petroleum industry. These hazardous (classified) locations such as NEMA 7 and 9 require special manufacturing techniques to ensure that codes and regulations are met. Many well known breweries across the country have Pantrol’s controls for the efficient, transport and handling of cans and bottles. These include load stabilizing, package compression units, roller conveyors, strapping machines, etc. Safety features are always integrated in our control systems. Lumber industries in the northwest, paper products, textiles, plastics and more are using Pantrol’s controls to keep their processes running smoothly. Drywall plants in the western states are loaded with our controls. One plant in particular that supplies gypsum board to the west coast area is totally controlled from start to finish by Pantrols’ controls. We can fine-tune your wastewater treatment processes for municipalities. This involves retrofitting control panels or upgrading what is existing to make it more efficient and dependable. Remote monitoring of levels and events (SCADA) can be included in these control systems. There really aren’t many industries that Pantrol does not deal with. We also specialize in the machine-tool, food processing, agriculture, automotive and irrigation/hydroponic arenas. Our local hog farmers are using our controls for automated feed systems. On a hot summer day, kids enjoy our water fountain controls in city parks. New industries that we are dealing with are associated with the “green- movement” --- hydro, solar and wind power as well as alternate insulation and recycled materials plants.